I've always loved the idea of syncing up all of my products with matching scents. Maybe it's my ocd, or maybe it's genius. I'm not sure. But when I discovered the Cocoon Apothecary Kahuna Collection, I had to give it a try. With scents of lemongrass and ylang ylang, this brightening, but soothing scented line includes a body lotion, bubble bath, bath salts, and hand soap. I won't be reviewing the hand soap today, but let's dive into their bath products. I'm really picky when it comes to body lotions. I find most of them are too watery, they don't sink in well, or they just don't do the job. But I love this lotion. It's light, but it really does moisturize my skin. It's not irritating, and while it has a scent, it's not overpowering, and instead of using fragrance oil, Cocoon Apothecary uses organic, healing essential oils. Lemongrass is one of my favourite scents, and I think it pairs really well with ylang ylang in this lotion, because it's uplifting, but the ylang ylang has a soothing, calming scent that's really nice in the evening. I usually steer clear of bubble baths because they're often made with terrible ingredients, and who wants to soak in chemicals all night? Not me. I went for this bubble bath because it's actually made with just five, mostly organic ingredients - coco glucoside (a soap), water, organic glycerin, and organic essential oils. If you have sensitive skin, I recommend only using one or two capfuls for your bath. Otherwise, you can use two to three capfuls. While you won't get the stereotypical bubbles that are big and huge, I was pleasantly surprised to find this creates a lot of bubbles that lasted the whole hour I spent in the tub. I love bath salts. While bubble bath is fun, bath salts are really where it's at. I always use several cups of epsom salts and a few handfuls of a bath salt like these. The simple ingredients are a dream for my sensitive skin - dead sea salt, epsom salt, and organic lemongrass and ylang ylang essential oils. The salts are rich in minerals and great for your skin; they're moisturizing, healing, and they reduce tension and relieve sore muscles. And the essential oils are just heavenly. I have a bath twice a week, on Mondays and Wednesdays, because I find those days are my busiest, so I always need a little extra self care at night. I light a candle, make a cup of chamomile tea and grab a book, and hop in the tub. I'll toss in several cups of plain epsom salts for lots of muscle and tension relief, a couple handfuls of the Kahuna Bath Salts, and one capful of the Kahuna Bubble Bath. When I'm out of the tub, I towel off, and use the Kahuna Body Lotion from head to toe to moisturize my skin. I do this step nightly, as my dry skin could always use some moisture. And that's that - a simple, calming ritual fueled by mostly organic ingredients! 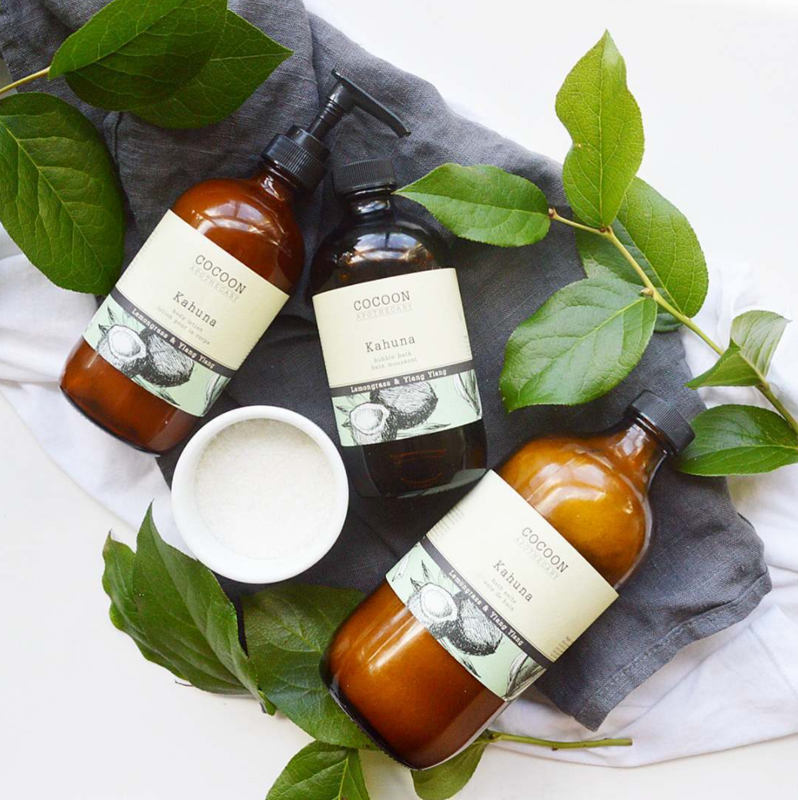 Have you tried anything from Cocoon Apothecary? What did you think?